I first heard about baby Leo and his dad Samuel Forest a couple of days before it blew up big on social media. In case you missed it, Samuel is bringing his son home to New Zealand after his wife abandoned them at birth in Armenia. Samuel had contacted me saying that he urgently needed help to bring Leo home to Auckland, the city I grew up in. After establishing that he had the basics covered regarding support from the New Zealand authorities he went on to arrange for social media coverage of his campaign to muster some support. That quickly went viral on Friday when mainstream media picked it up, and he has been overwhelmed by the response to his appeal for help. Once things settle down we will work with our local Down syndrome community to ensure he is practically supported when he returns to Auckland. Its days like these that make our mission so worthwhile. It is wonderful to see Kiwis and indeed the whole world responding with such unconditional love and compassion, as we build a culture of inclusion for our children. The media have, however, focused somewhat on the adverse culture in Armenia towards those with Down syndrome. Many have reported that there is a context behind the mother abandoning her child. Now, that got me thinking about our mission, and our own culture of bias over here in New Zealand. Now, don’t get me wrong. New Zealand has a strong culture of inclusion for our children, who enjoy free health care, education and social support on a relatively equal basis with others. There are areas to improve, but we are heading in the right direction. It’s not that long ago that our children were institutionalised. In New Zealand, parents generally now don’t abandon a newborn with Down syndrome. They will be well supported and included in society. But off course, those babies have to be born to be included. And here’s the cultural rub. Here, in my own country the majority of babies with Down syndrome, about 55%, are abandoned before they are born. So, I started to think about the cultural dichotomy of abandonment in Armenia and New Zealand. How would this story unfold if it were in New Zealand and not Armenia? Off course, we don’t know the full answer to that question. But here are a few things we do know. They apply to most (so-called) first-world countries. The pregnant mother would have been routinely offered free prenatal screening for Down syndrome under a state sponsored programme directed towards detecting the condition in a pregnancy. If she subsequently had a high chance screening result for Down syndrome, based on a blood test and ultrasounds, she would be offered a free diagnostic test to confirm a diagnosis. If she had a confirmed diagnosis, she would be offered a selective abortion, paid for by New Zealanders. We don’t know whether she would have availed herself of the opportunity to abandon Leo before birth. We know that she may be encouraged to have an abortion by New Zealand medical professionals. Mothers in these situations want to be pregnant. That is why they are receiving prenatal care. They deserve the same empathy and support in continuing their pregnancy that they enjoyed before an unexpected diagnosis. We can, and should have empathy for women in these situations. Unfortunately, we know that in the majority of cases worldwide, a prenatal abandonment would be the outcome. The odds are well against the Leo’s of this world being born at all in first-world countries with national screening programmes. We do know that Samuel Forest would have had no rights as the father of Leo if the pregnant mother chose a Down syndrome selective abortion. Prenatal abandonment is our cultural norm, and widely accepted in many countries. And what we do is work for our children to be born free from discrimination. So here is the rub. We rightly reject Armenia’s culture of abandonment, but we have our own cultures of abandonment. We just dress it up differently. We condemn one and endorse the other. That needs to change to build a culture of inclusion. 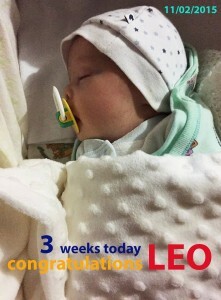 Off course, baby Leo’s story is fantastic, saved from being abandoned, destined for a better more promising life. It’s been leading news, and that’s excellent too. People have rallied behind Samuel because they see the value in his baby’s life and the brave choice he made in a tough situation. It’s a brave and right choice. Father to father, and Kiwi to Kiwi, I will stand with Samuel and Leo to build a better culture of inclusion for our children. They deserve it. And that is why we are in the business of saving those with Down syndrome. They have every right to be here, just like you and me. We need to become more ethical in these situations, remove the barriers of bias against our children, break down the culture of abandonment, and build an inclusive world for all. Around 50 years ago it was also common practice in New Zealand to recommend putting newborn babies with Down syndrome into an institution. Our last large psychopaedic hospital only closed in 2007. Adoption fortunately replaced institutionalisation as an option from the 1970s and 80s, but sadly around the same time antenatal screening and testing were introduced. I am conscious that both my adopted daughters may owe their lives to the fact that both birth mothers were too young to qualify for free antenatal screening; now with the requirement for midwives to offer antenatal screening to every pregnant woman, no woman is too young. I been single mother of my STEPHANIE since her ignorant dad walked out on us because “he dont have retarded kids” N AM REALLY PROUD TO SAY ITS BEEN THE BEST 15 years of my life!!! yes-at least he got born! In NZ fortunately to have a DS baby does not bring shame on the family as it appears to in Armenia (you have to wonder if they would be up there with Denmark and be “DS-free” within a couple of generations should routine screening become available there)……but, there is pressure to abort in NZ (and Denmark) for other reasons such as….well what? The child will be a burden on parents, family & society? So is shame any worse than the notion of burden? That is not correct for Denmark. Thank you for sharing both the “beginning” of this story and how it relates to the bigger issues.